Following the Civil War of 1994, Yemen experienced few years of relative peace. This was rudely interrupted in 2004, when the government opened the first of six campaigns against the movement colloquially known as ‘Houthis’. The Yemeni Air Force – partially re-equipped over the previous years – saw intensive involvement in this conflict, but proved insufficient. In late 2009 and through 2010, the war spread into Saudi Arabia, which reacted with its first military intervention in the country. A host of long-simmering internal conflicts culminated in the second Saudi-led military intervention in Yemen, launched in March 2015. 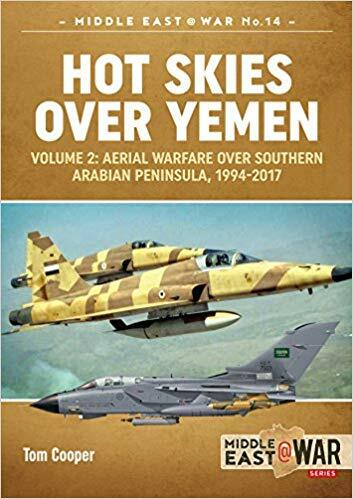 Although run along widely accepted Western doctrine of aerial warfare, and highly effective, the campaign in question experienced a number of massive problems – primarily related to unexpected developments and extremely complex relations between multiple parties in Yemen. That the air forces of the Saudi-led alliance involved in the ongoing campaign in Yemen are operating some of most modern combat aircraft and weaponry manufactured in the West is no secret. But, exactly how, why, when, and where are they deploying weapons systems in question and for what purpose remains entirely unknown in the public. Thanks to approach to first-hand sources, this volume is providing answers to precisely these questions and thus providing an exclusive insight into the conduct of operations by such modern aircraft types like F-15S, F-16E/F, EF-2000 Typhoon, and Mirage 2000. Containing over 140 photographs, colour profiles, maps and extensive tables, Hot Skies over Yemen is a richly illustrated and unique point of reference about one segment of modern aerial warfare that remains entirely unknown until today.